Sometimes we don’t give Warren Ellis the love he deserves. Oh sure he’ll write your six issue Moon Knight run, or Secret Avengers and drive everyone wild, but sometimes we don’t appreciate just how much simplicity of craft can be a superpower. While Moon Knight relied on upending what had been a character compromised by wildly differing takes, or Secret Avengers relying on the beauty of narrative pyrotechnics in every issue, James Bond is the first long form (or at least longer than one trade) run he’s done on a mainstream property in awhile. When you have an extended period of time to get reacquainted with the sort of work Ellis can bring to a character, it brings an interesting sort of perspective when it comes time to review the book. While Ellis is known, perhaps unfairly so as a writer who pipes his characters full of snarky quips, his James Bond is perhaps one of the least “funny” characters he’s written. That isn’t to say Bond doesn’t snark, but he’s decidedly not a sympathetic character like even Moon Knight, he’s an upper class snob and Ellis doesn’t hesitate to remind you of that fact. The last arc had Bond dealing with a new drug trade, and mad cyborgs. Not quite your typical Bond story, but how do you top that? Just drop Bond in America. While it’s easy to imagine Bond as suave, his brusqueness towards people getting in his way defuses that, and moreover it comes off as a sort of whininess in the way Ellis plays Bond against stuff he’d normally take for granted. Like LA gridlock being the ultimate villain that stalls Bond from escaping with his target. One of the best parts of this Bond book has been watching Jason Masters at work. Ever since he first showed up on my radar working fill-ins in Batman, Incorporated, it’s been interesting watching him finally do his own thing. 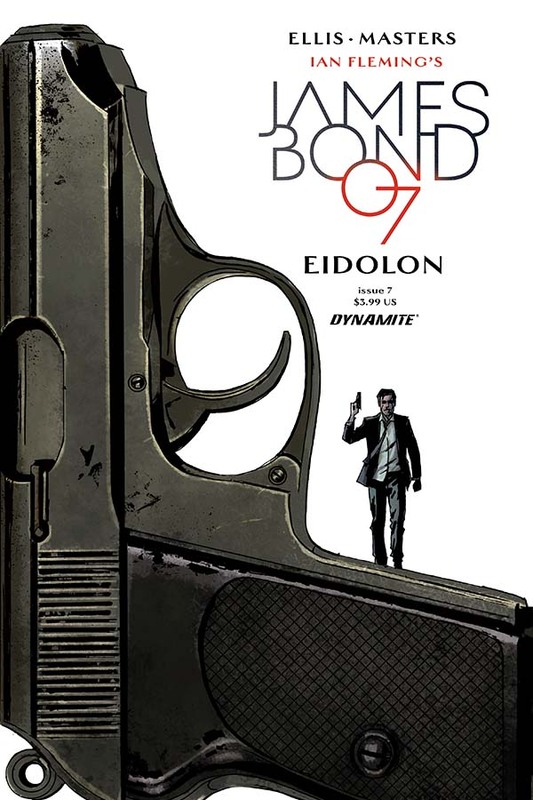 One of the things this Bond movie can do as a comic is work off an unlimited budget the movies don’t have, and that includes a level of violence that plays off the more nasty Bond we have at hand. Masters does a great job playing with the locales, differentiating and giving you a real inhabitable space beyond just the confines of the story, and distinguishing his Bond from even the current Daniel Craig iteration. He’s handsome, but he’s definitely one who’s more of a roughneck by comparison. Whether that involves smashing someone in with a brick, or blowing a hole in their head, this Bond does not care what you make of him. And his enemies are as deadly of a match in this case, with the kineticism, and the willingness to stretch the contours beyond what a normal viewer might be used to for a Bond story. With masterful craft such as this, gorgeous locales, vicious action, and a willingness to experiment, this book is definitely worth your time. 5 out of 5 MITs.